Dimensions: H26cm x W30cm. Please note the dimensions and thickness of the slate may vary slightly as the product is cut from natural slate. Note: Your text will be printed exactly as you have entered it on each link in the boxes provided. 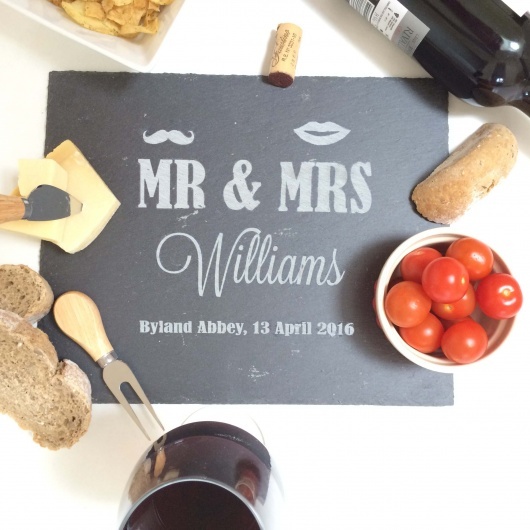 A fun and personalised slate cheeseboard which makes a fantastic personalised wedding gift for any cheese lovers. Can be personalised with a family name and date. 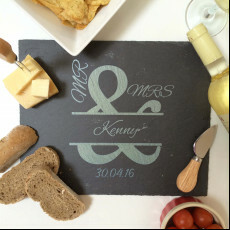 Our Personalised Slate Cheeseboard is beautifully hand-crafted in Yorkshire and makes a fantastic gift any time of the year for a cheese lover. Please note that this cheese board is made from natural slate so because we think its slight imperfections add to its appeal. You might spot mottling, fine grey thread lines, colour blemishes and a maybe a few cracks but we hope you’ll agree that they add a touch of character to our slate designs. 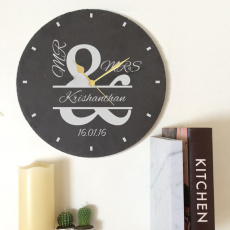 You can be personalise this beautiful slate cheeseboard with the newly weds family name and date of the wedding. Your text will be printed exactly as you have entered it on each link in the boxes provided, so please double check spelling, punctuation and capitalisation. We will not add punctuation or amend incorrect punctuation. We will print exactly what you add into the box so please ensure it is correct. We cannot refund or replace your order if it is your error. Please note does not come with cheese, wine or knives!